The "super-committee" that will decide $1.5 trillion in cuts and potentially sweeping changes to entitlements and the tax code has raked in hundreds of millions of dollars from special interests in their careers. Who owes who? The Congressional “super-committee” finally has a roster: we now know the twelve men and women tasked with cutting as much as $1.5 trillion from the federal budget, and quite possibly restructuring entitlements and rewriting the federal tax code. Unlike any other Congressional committee in recent memory, this “super-committee” will wield enormous legislative power. Their recommendations will be fast-tracked in Congress, meaning they cannot be amended and are guaranteed a simple-majority vote in the Senate. If the super-committee does not produce recommendations, or if Congress does not approve them, massive triggers will be activated: $1.5 trillion will be cut from the budget, drawing equally from defense and domestic spending. Legislators on both sides of the aisle are already concerned about the cannons of cash now aimed directly at the super-committee members. Republican Senators David Vitter and Dean Heller have both introduced legislation to impose transparency requirements and additional financial disclosure from members of the super-committee; in the House, Democratic Representative Mike Quigley and Republican Representative Jim Renacci are circulating a letter calling for, among other things, weekly disclosures from super-committee members campaign contributions and meetings with lobbyists. Super-committee members, who were selected to represent their party, not strictly their own interests, will no doubt act for a wide variety of strategic and political reasons. And as The Nation‘s Ari Berman has written, there are much larger problems with the scope of the committee regardless of who is on it, because it will choose between a variety of bad options, and cannot act on job creation. But it’s still important to understand what industries are lobbying them—and which industries already have the inside track. To that end, The Nation looked at campaign finance data from the Center for Responsive Politics for each member—Democratic Senators John Kerry, Patty Murray, Max Baucus and Democratic Representatives Xavier Becerra, James Clyburn and Chris Van Hollen; and Republican Senators Jon Kyl, Rob Portman, Pat Toomey and Republican Representatives Fred Upton, Dave Camp and Jeb Hensarling. 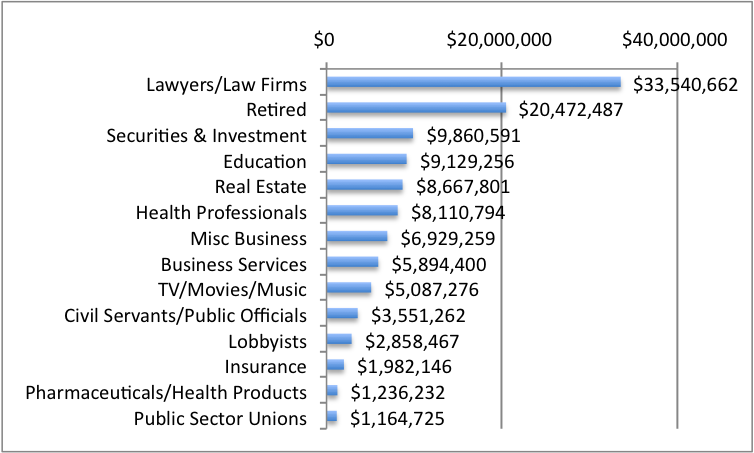 Two areas were examined: donations from Political Action Committees, and industry donations—money from industry PACs and individuals associated with that industry. The totals are since 1998, when the data becomes available, or over the member’s career since then (in their current seat). When the dollars are tallied, it’s clear that the committee’s Republicans have filled their campaign coffers with Wall Street money–that’s their largest contributor. Democrats have substantial backing from labor groups that could serve as a counterweight, but they take in quite a bit of Wall Street cash themselves. Representatives Clyburn and Becerra, along with Senator Murray, have the largest labor donations, each topping $1 million. Senator Kerry has the lowest from that group, with $267,861. The high totals for labor are typical for Democratic politicians, but may be a good sign for progressives hopeful the Democrats will stand strong against entitlement cuts, which unions strongly oppose. The health industry is next, followed by the finance, insurance, and real estate sector—these are non-health insurance companies, commercial banks, finance and credit companies, securities and investment firms, and other big corporations typically found on Wall Street. Senator Baucus is the heavy hitter in this category—as chair of the Senate Finance Committee, he’s raked in $1.6 million from this sector. The only other member over $1 million is Representative Clyburn. Note that for Democrats, both defense and agribusiness are fairly low on the list. Democrats might be more tempted to look toward farm subsidies and defense cuts when the red pens come out. Also, “ideological/single-issue” groups are fifth on the list, but a vast majority of that money was given to Senator Murray, and primarily by women’s groups. This money probably won’t have much bearing on the super-committee. Health is the next category, representing largely the for-profit health industry—medical professionals, HMOs, and pharmaceutical companies. 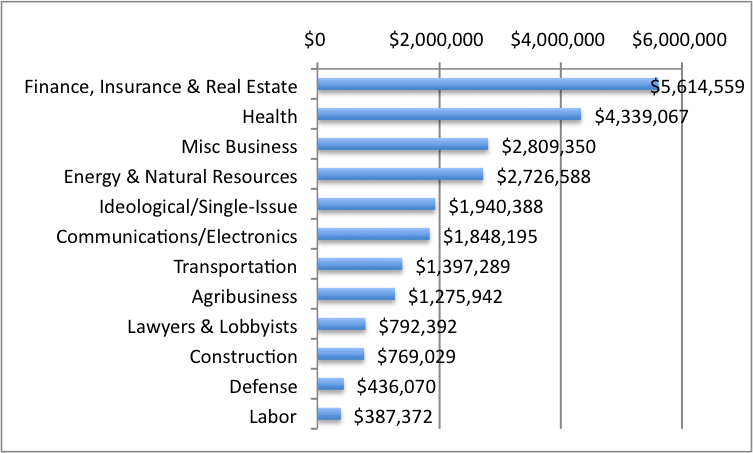 “Ideological/single issue” PACs place fifth, with just under $2 million in contributions. That money is spread very evenly across the six members, suggesting they each are beholden to active, wealthy conservative groups. Naturally, labor is last on this list, but note that defense is second-last. The defense industry doesn’t have much money invested in this group, and none are prominent hawks. The other category we examined was donations from industries. This includes both industry PACs and contributions from individual donors affiliated with a particular industry. 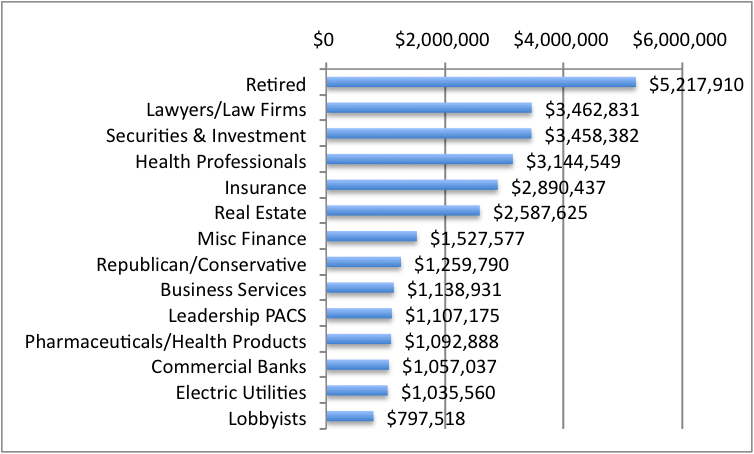 Interestingly, people who mark “retired” on their donations are by far the largest group donating to super-committee Republicans, who collected $29.7 million from their top fourteen industries since 1998. (Like the PAC money, this is much lower than the Democratic total. But it’s important to note that Senators Toomey and Portman are new to the Senate, while the Democrats have all been in Congress since at least 2004, most since before 1998. 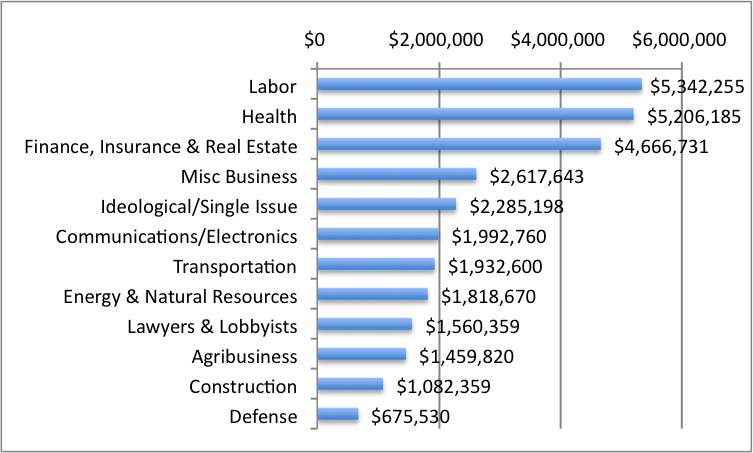 The data represents the money each industry has invested in the super-commmittee). The high amount of money from the retired is not totally surprising, given that Republicans are generally an older party, but the super-committee Republicans do indeed have a large number of donors who could be harmed by cuts to Medicare or Social Security. Again, this data doesn’t provide a unifying theory of how each member will act. There are certainly larger political calculations at play. But when they start getting deep into the federal budget, removing or reducing potentially hundreds of lines, or when they attack the vastly complex tax code, there’s no doubt that special interests will come calling.